CeCe Moore and Shannon Christmas discussed strategies for using autosomal DNA to resolve your genealogical problems on BlogTalk Radio. Part One of this discussion took place on 28 June 2013 and is archived at http://www.blogtalkradio.com/bernicebennett/2013/06/28/strategies-for-using-autosomal-dna. Part Two took place on 28 October 2013 and is archived at http://www.blogtalkradio.com/bernicebennett/2013/10/28/strategies-for-using-autosomal-dna-part-ii. How much time do you have to invest in analysis of distant matches? If time is limited focus first on closer matches (those with the largest shared DNA segments). Don't ignore "low-hanging fruit" such as matches with a common surname or geographic region or shared haplogroup that may match a line you are interested in. If more time is available the more distant matches should also be analyzed. Some of these may not prove fruitful, but some will. AncestryDNA matches through trees can be very useful [DPW comment: assuming the trees are accurate.] AncestryDNA uses mega-base pairs, not centimorgans, as the unit of measurement. See CeCe's blog post, "Ken Chahine Answers My Questions and Reveals Behind-the-Scenes Information about AncestryDNA" for more information. Family Tree DNA requires a total shared number of centimorgans (all segments added together) and at least one segment over the 7.7 centimorgan threshold to be considered a match. Smaller segments must also be indicative of being a part of the same population; this affects African American testers who may have DNA from multiple populations. 23andMe requires 7.0 centimorgans and 500 SNPs to be considered a match. 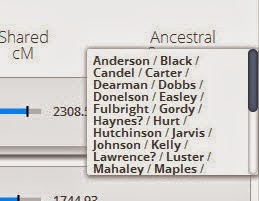 Ancestry Finder reduces the threshold to 5.0 centimorgan segment sizes. DNAgedcom.com offers some very useful tools for DNA analysis. DNAadoption.com offers a documented methodology and online classes for atDNA analysis. 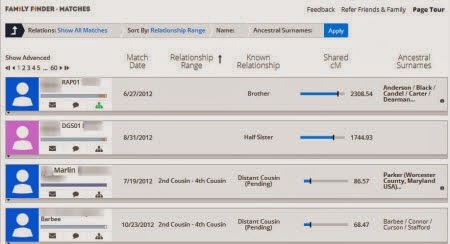 The same techniques that work for adoptees work for other genealogical brick walls. Any atDNA match sharing more than .40 percent (that is point four percent, which is over 30 centimorgans) is considered a close match. Many other educational opportunities are also available. CeCe Moore presented an advanced autosomal DNA analysis webinar for the Association of Professional Genealogists (APG) on 21 September 2013. It hasn't been archived yet, but presumably will be available in the APG Members Only area at some time in the future. The handout for this session is extremely useful. Part 2: "Yikes, My DNA Results are Back! Now What?" recorded 29 November 2012.
the MP3 for session 21615 — T-217, "Going Nuclear: DNA Discoveries to Trace All Lines of Descent" presented at the Federation of Genealogical Societies 2013 Conference, Journey Through Generations, in Fort Wayne, Indiana. Khan Academy, Udacity, and Coursera offer online classes in biology and genetics, some free and some with a fee. Many other educational opportunities are coming soon like a week-long Practical Genetic Genealogy course at the Genealogical Research Institute of Pittsburgh (GRIP) in July 2014, more DNA sessions at the Forensic Genealogy Institute, and many more all-day genetic genealogy offerings which will be highlighted in the future. Debbie Parker Wayne, "Learning About Autosomal DNA for Genealogy," Deb's Delvings Blog, posted 29 October 2013 (http://debsdelvings.blogspot.com/ : accessed [date]). Last year in the Forensic Genealogy Institute session on DNA I used a chart showing the statistical percentage of shared DNA between two people. There are several versions of this chart that can be found online. I like this colored, tabular version better than some of the others I have seen. I told the institute attendees I would post the chart. I guess a year later is better than never. I updated the chart and added some links to additional information that were not on the document a year ago. 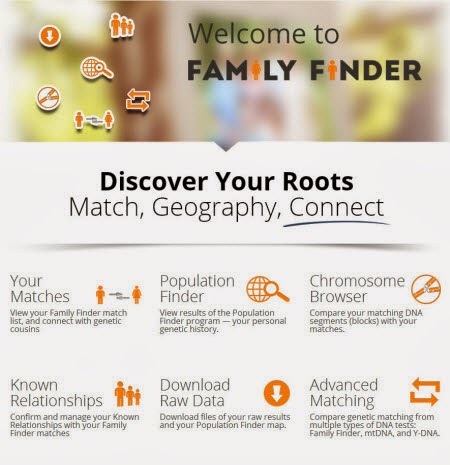 I hope this is useful to some genetic genealogists. This image shows only a small portion of the chart. A PDF version of the document is available here. On the referenced ISOGG Wiki page at http://www.isogg.org/wiki/Autosomal_DNA_statistics#DNA_percentages follow the link to Tim Janzen's website as there are some very useful examples and explanations of autosomal DNA test analysis. Debbie Parker Wayne, "Percentage Shared atDNA Chart," Deb's Delvings Blog, posted 29 October 2013 (http://debsdelvings.blogspot.com/ : accessed [date]). This post has been superceded by the updated documents and additional information in the Publications area of my website. A few years ago The Genetic Genealogist Blaine Bettinger posted several versions of X‑DNA inheritance charts. 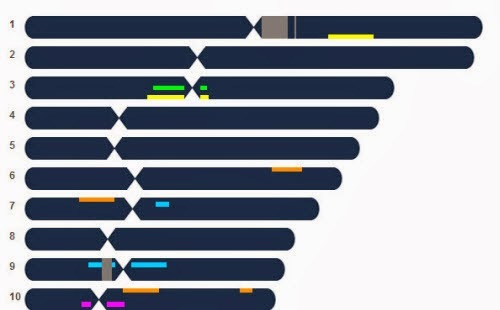 Colored blocks on the charts indicate which ancestors might contribute segments to a person's X chromosome(s). 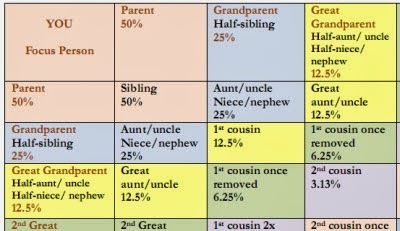 The percentage of X‑DNA that each ancestor might contribute was shown in one of the later charts.1 Blaine explains X‑DNA inheritance in those posts as well as providing the charts. I formatted this information into a Microsoft Word table so I can type the names of the ancestors of a person who has tested for use in X‑DNA analysis. I don't like to use handwritten charts when I can create a printed version. With Blaine's permission I have attached a Creative Commons license2 and am linking several different electronic formats of the documents for use in compliance with the Creative Commons license. I hope these charts prove useful to the genetic genealogy community. If anyone has problems or sees errors in the charts please let me know so they can be corrected. All URLs accessed 25 October 2013. 1. Blaine Bettinger, PhD, JD, "Unlocking the Genealogical Secrets of the X Chromosome," 21 December 2008, The Genetic Genealogist (http://www.thegeneticgenealogist.com/2008/12/21/unlocking-the-genealogical-secrets-of-the-x-chromosome/). Blaine Bettinger, PhD, JD, "More X-Chromosome Charts," 12 January 2009, The Genetic Genealogist (http://www.thegeneticgenealogist.com/2009/01/12/more-x-chromosome-charts/). 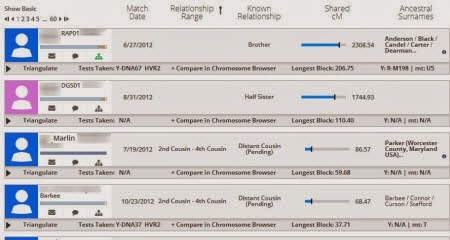 Debbie Parker Wayne, "X-DNA Inheritance Charts ," Deb's Delvings Blog, posted 25 October 2013 (http://debsdelvings.blogspot.com/ : accessed [date]). The golden oldies never die. At least not as long as there is one person left to fall for the scam. I just got a phone call from "Windows Support" from a guy named "Mike" with a mild accent reminiscent of the Indian subcontinent. Mike was here to help me. His company was getting reports from my computer indicating there was a virus on the computer. He wanted to help me fix the problem. Sadly, we had a bad connection. Mike patiently called me back. It took a long time for the phone to ring again. Mike talked more, apparently following a script and talking over my questions to him. I mentioned I thought my ISP would be the most likely group to contact me if there was really a problem. I asked if he worked for "my ISP" without telling him the name of my ISP. More bad connection problems causing funny sounds on the line. Mike called me back the third time. I asked why my computer would have contacted him as I have it configured so it does not send problem reports out without asking permission first ... all of a sudden Mike could not hear me. Now, I still heard him clearly, and there were no funny sounds on the line, but all of a sudden Mike was gone again. Mike did not call back to help me fix this terrible problem he had been alerted to. The above is written sarcastically. But if you don't know about this scam or how computers and the internet work you might believe this sincere sounding person is really calling to help. Please, please, please, do NOT let anyone calling like this talk you into doing anything on your computer and do not give any personal or financial information. At the very least they will ask for money for the time spent helping you. Once they have your Paypal account info or credit card number you know what will happen next. And they may install software on your computer that will allow them to perform nefarious tasks that seem to have been done by you or they can wipe out all of your files or any of hundreds of other terrible things. This is a known scam. Eve Blakemore, "How to combat tech support phone scams," Security Tips and Talk, Microsoft (http://blogs.msdn.com/b/securitytipstalk/archive/2013/05/23/how-to-combat-tech-support-phone-scams.aspx : accessed 22 October 2013). Frank Catalano, "'We're with Windows': The anatomy of a cold-calling scam," GeekWire, 14 July 2013 NBC News Technology (http://www.nbcnews.com/technology/were-windows-anatomy-cold-calling-scam-6C10631331 : accessed 22 October 2013). 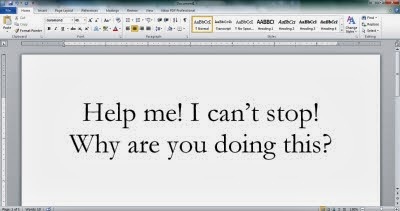 Aurich Lawson, '“I am calling you from Windows”: A tech support scammer dials Ars Technic,' Ars Technica (http://arstechnica.com/tech-policy/2012/10/i-am-calling-you-from-windows-a-tech-support-scammer-dials-ars-technica/ : accessed 22 October 2013). Mathew J. Schwartz, "Microsoft Windows Support Call Scams: 7 Facts," Seccurity, InformationWeek (http://www.informationweek.com/security/management/microsoft-windows-support-call-scams-7-f/240005023 : accessed 22 October 2013). P.S. In the time it took to write this blog post, Mike either forgot he had already called and hung up on me or he decided to try his luck again. He called back, then hung up on me again after just a few seconds. No acting like the line was bad this time, just a fast click then silence. Debbie Parker Wayne, "Really scariest words: I'm from Windows Support and I'm here to help you," Deb's Delvings Blog, posted 22 October 2013 (http://debsdelvings.blogspot.com/ : accessed [date]). There is a brouhaha in the genetic genealogy community this week and coverage in the worldwide media about patent 8,543,339 that was just awarded to 23andMe. The official title of the patent application is “Gamete donor selection based on genetic calculations,” but some are calling it a "designer-baby" application. My initial reaction to many of the articles was to wonder how this is different than what has been happening with sperm and egg donor selection for many years. I have friends who used a long list of preferences to select a sperm donor. That seemed like a perfectly reasonable thing to do. So I had to read patent 8,543,339 to see if it included something else that I was not getting from the blog posts and news articles. The same calculation could be performed for multiple traits or conditions. I would then make a decision whether or not I wish to have a child whose other biological parent is this person, just as I would do now based on a donor's profile without DNA analysis (or my attraction to a mate and desire to have offspring). The complicated stuff in the patent comes in with a description of the algorithms used to analyze the DNA for the likelihood of the resulting child having the specific trait or traits. I did not see anything in the patent related to modifying the genes in the egg or sperm to achieve specific traits, just calculating the odds of the trait occurring in a child created with these biological parents. It seems like this patent is just covering the addition of using DNA data to do something we do now with physical and personal traits, beliefs, and characteristics of a potential donor or mate. This doesn't strike me as "designing a baby" any more than we do now except we add DNA and statistical analysis to the mix. Personally, I may not agree that we should use genetic analysis to select for a baby with a particular eye color. Trying to give a baby the best chance of survival with the least chance of a debilitating disease seems harder to argue with. While I was mulling this over, Blaine Bettinger, an intellectual property attorney with a PhD in Biochemistry, wrote a blog post titled "A New Patent For 23andMe Creates Controversy. "1 I agree with Blaine's conclusion in his article as related to the patent itself. I think everyone should read Blaine's article before coming to a conclusion about this issue. A lot of the controversy this week for genealogists seems to be because our DNA data was used for research we didn't realize it might be used for when we gave consent for it to be used. This makes it even more important that we understand exactly what we are giving permission for when we agree to let a company use our DNA for research or when we upload our DNA data to a server where the information might be publicly shared. Every person will have to decide for herself what she wishes to agree to. But without research, progress in using DNA for any purpose will be stymied. I have been reading American Property: A History of How, Why, and What We Own by Stuart Banner.3 This book presents, in a very readable way for the non-lawyer, a history of American laws on property and ownership. It includes a chapter on "Owning Life. "4 All of the chapters give an insight into how American legal thinking on property of all kinds has changed over the decades. The book covers how technological changes have impacted several legal decisions related to property. Banner doesn't specifically discuss DNA in the context of today's controversy. He does discuss the legal framework and history we should understand as we determine how genetic information and other biological material could or should be used in the future. We need to have a serious discussion about how we proceed so misunderstandings are reduced as much as possible and we can all make good decisions. These discussions should include genealogists, historians, and those from all walks of life as well as geneticists and medical practitioners. The social scientists, hard scientists, legal representatives, and educated and interested people need to cooperate to find the best way forward for humanity. But I hope everyone who wishes to be part of the process will study our history, the good and bad, and understand the implications for the future of the decisions we make today. I don't have all the answers. As a matter of fact, I have more questions than answers about how we should proceed. But frankly, I think those of us who don't jump in wholeheartedly on one one side or the other are the ones who are needed the most as humankind determines how to ethically use what we have learned about DNA in the past and what we will learn in the future. All URLs accessed 7 October 2013. 1. Blaine Bettinger, PhD, JD, "A New Patent For 23andMe Creates Controversy," 7 October 2013, The Genetic Genealogist (http://www.thegeneticgenealogist.com/2013/10/07/a-new-patent-for-23andme-creates-controversy/). See links in the first three paragraphs for blog and mass media articles. For full disclosure, I will be working with Blaine and CeCe Moore to present a week-long course on Practical Genetic Genealogy next summer at the Genealogical Research Institute of Pittsburgh (GRIP). 2. Rob DeSalle, PhD and David Randle, PhD, "Genetics and Society: A Course for Educators," Coursera online free courses (https://www.coursera.org/course/amnhgenetics). 3. Stuart Banner, American Property: A History of How, Why, and What We Own (Cambridge, Mass. : Harvard University Press, 2011). See also Robert C. Deal. "Review of Banner, Stuart, American Property: A History of How, Why, and What We Own," H-Law, H-Net Reviews , posted June 2011 (http://www.h-net.org/reviews/showrev.php?id=32895). See also Harold Henderson, "Jenny Lind, Elvis Presley, and the Evolution of Property in the US," Midwestern Microhistory: A Genealogy Blog, posted 30 July 2012 (http://midwesternmicrohistory.blogspot.com/2012/07/jenny-lind-elvis-presley-and-evolution.html). 4. With gratitude to my friend and role model Stefani Evans, CG, for prompting me to move this book to the top of my to-read pile when she pointed out this chapter and the references throughout the book to intellectual property arguments and rulings. Driving 300 miles is not always fun. But the drive between East Texas and Hot Springs Village, Arkansas, is a nice, easy, half-day drive when you don't get stopped for construction on Interstate 30. Only about half of the trip has to be done on the interstate. 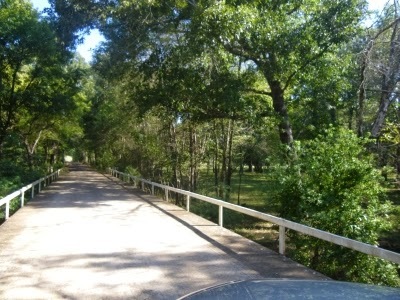 The other half is through pretty, peaceful areas of East Texas and Arkansas on U.S. and state highways. 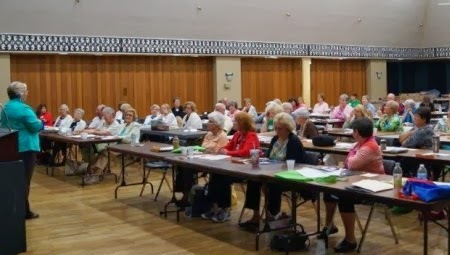 This was my second year to do an all-day seminar for the Hot Springs Village Genealogical Society and Akansa Chapter NSDAR. Thanks so much to Village Genealogical Society President Celinda Chapman, long-time workshop organizer Jeanette Frahm, lunch deliveryman locator and workshop organizer helper Marcie Guise, Akansa NSDAR Regent Joyce Wood, and all the other volunteers who helped make the workshop fun and interesting for me and all of the attendees. We had a nice crowd of attendees who asked good questions. 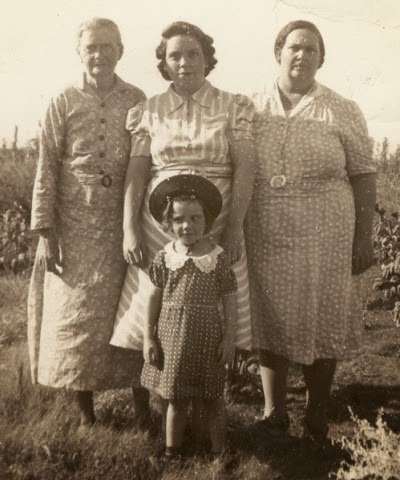 It was obvious a lot of them really get why genetic genealogy is now a mainstream part of genealogical research and not this weird thing only a few of us odd ducks are doing. 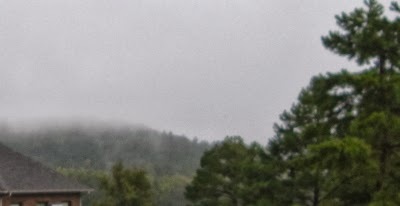 The drive home Sunday morning started off in a cool, misty, ethereal-looking way with low clouds obscuring the trees on the peaks of the hills. I never ran into more than a light drizzle for a few minutes on the way home. Then dappled sun through the trees on the last leg of the drive. Thanks for inviting me to Hot Springs Village and for attracting such an interesting group of attendees from the local area and as far away as Little Rock. I thoroughly enjoyed seeing familiar faces from last year and some new faces. I even got to see one of my Parker cousins I met last year at the Henry Parker family reunion in Russellville, Arkansas. 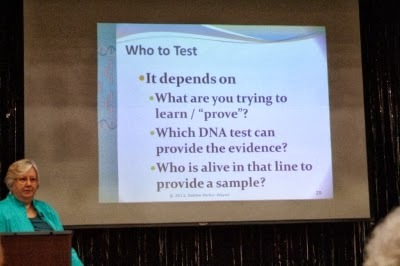 Many of my examples in my DNA presentations use test results from my Parker line so I hope Karen found these more personally useful than the other attendees. It might be harder to get to this area for some other speakers. I guarantee you will have a good time with a knowledgeable group of researchers if you accept a speaking invitation from this group. 1. Photo credits: © Hot Springs Village Genealogical Society, taken 28 September 2013, used with permission. 2. Photo credits: © Debbie Parker Wayne, taken 28 September 2013. 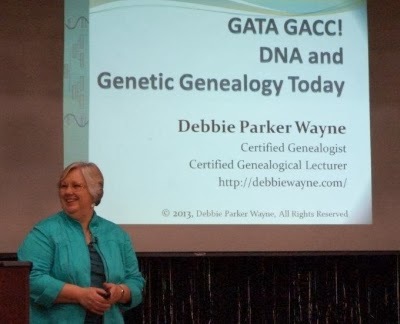 Debbie Parker Wayne, "DNA Day Workshop at Hot Springs Village, Arkansas," Deb's Delvings Blog, posted 2 October 2013 (http://debsdelvings.blogspot.com/ : accessed [date]).